The latest residents cycling through this large space next to a biker AA hangout are a very friendly Chinese family. As far as the lounge goes, well, there was one older lady there when I dropped by and she told me the bartender made very good cocktails -- then a few minutes later had to explain to her what serving a drink "neat" is. Historical Notes: This structure was built in 1933 and by 1943 it was the "White Stone Tavern," which it appears to have remained at least into the 70s. The river rock which comprise virtually the entire exterior of the building have since gone though various color changes, including orange and now yellow. When I first moved to the neighborhood many years ago this was Travelers III, a popular native American bar where you could count on seeing cop cars pretty much every Friday and Saturday night. You could always count on the most drunk people on the #6 (now #358) bus getting off at that stop and staggering in. In 1980 it is listed as the "Brooklyn Bridge Tavern" and in 1983 as "Rose Garden." After Travelers, it had a nice little run as a second Steel Pig BBQ, but I don't know if it's ever been half full since those early days. 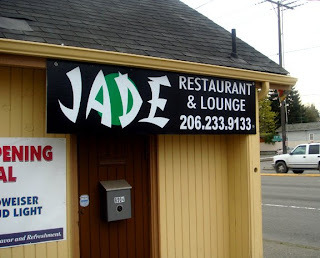 I'd like to see the current residents make a go of it, though there are at least three other Chinese restaurants within a couple blocks, with a less imposing exterior. And you may want to give the bartender a year or two to pick up her trade before going there for cocktails.